Dermal Fillers Toronto or Botox? 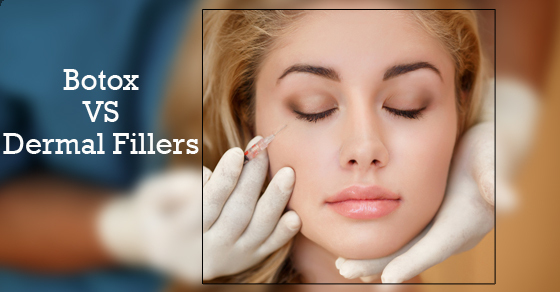 It is important to know the differences between Botox and Dermal Fillers . Although Botox and Dermal fillers complement each other, they are not similar. Botox is an injectable drug used to temporarily paralyze overactive muscles that cause dynamic expression wrinkles, while dermal fillers are used to essentially fill them and contour the face. Not all wrinkles are created equal. “Dynamic wrinkles” are caused by repetitive wrinkling of the skin such as frowning or squinting, while others known as “static wrinkles”, form with the natural aging process along with volume loss. Botox relaxes wrinkles, while dermal fillers fill them. Dermal fillers, such as Juvederm, Teosyal and Restylane, tend to work best on wrinkles that are visible when the face is relaxed. Dermal fillers eliminate these wrinkles by plumping up the skin layers, increasing fullness and pushing out wrinkles and creases. In addition to softening wrinkles, dermal fillers can also be used to plump up thin lips, create fuller cheeks, as well as fill hollows, to create a fuller, more youthful appearance. Combining both Dermal fillers and Botox together can provide dramatic results than just using one product alone. By combining both treatments, not only will it help address static wrinkles and dynamic wrinkles at the same time, but it can create a youthful appearance and a non-surgical facelift with little to no downtime. For more information on Dermal Fillers and Botox visit, https://www.lastinglooks.ca/botox-dermalfillers-toronto/ at Lasting Looks Clinic in Toronto.